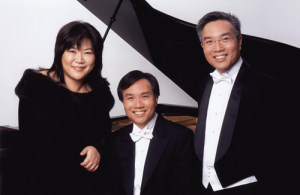 Three pianists, all multi-international competition winners with established solo careers, come together for a stunning collaboration.This recording showcases the virtuosic talents of Angela Cheng, Alan Chow and Alvin Chow. The artists perform in different combinations on two pianos and in spectacular arrangements of “Carmen” and “West Side Story”, featuring all three at the same piano. Beautiful, exciting and always compelling, this exquisite recording has something for everyone.